Kumquats are some of the easiest fruit trees to grow in garden pots. Kumquat trees are beautiful, with dark, glossy green leaves and bright orange fruit which is both gorgeous and delicious. Though considered by many a citrus fruit, they are actually classified in the genus, Fortunella. The most commonly grown type is the Nagami kumquats, which have oblong fruit. When ripe, kumquats have a sweet, edible skin and a sour fruit inside. They can be eaten whole, made into marmalade, or used in other dishes. When grown outdoors, kumquat trees can reach 8 feet tall and 6 feet wide. Grown in pots, their size will be smaller. Kumquat trees need full sun; they do best with at least six hours of sunlight a day. When your plant is inside, give it as much light as possible. You can place it in a sunny window (though be careful that too much direct sun doesn't burn your plant), or set it under grow lights or shop lights fitted with one cool and one warm bulb. Your kumquat will also survive if you give it bright, indirect sun. Kumquats do well in potting soil with any pH, but if you choose to grow them directly in the ground, add a high-quality potting soil to enrich the soil. You can add a layer of pebbles or gravel to the pot (or to the hole in the ground) to ensure proper drainage. Proper watering is one of the keys to growing any citrus plant, but particularly those grown in pots. The aim is to keep the soil moist but not wet. Stick your finger into the soil, at least up to the second knuckle. If you feel dampness at your fingertip, wait to water. If it feels dry, water your plant until you see it run out of the bottom of the pot. If your plant is indoors, particularly in winter when the heat is on, misting the leaves with water can help keep your kumquat tree happy. It's also a good idea to use pot feet, so your plant doesn’t sit in water. Kumquats are hardy to down to 18 degrees Fahrenheit and should be brought inside or protected (covered with a blanket) if temperatures dip lower than that. It is recommended that they only are kept outside all year in zones 8 to 10. In spring, bring your tree outside and put it in a sunny, protected spot when nighttime temperatures are consistently above freezing. It’s a good idea to slowly acclimate any plant to outdoor conditions by hardening it off. Kumquats need regular fertilizing, except in the heart of winter. In the spring, feed your kumquat with a slow-release, all-purpose, or citrus fertilizer. During the growing season, regular applications of a diluted liquid fertilizer, such as liquid kelp, fish emulsion, or a seaweed and fish emulsion combination is a good idea. Water well before and after applying fertilizer to prevent burning the plant. You can repot your kumquat every two to three years with a container that is slightly larger than the original. The best time to repot citrus is the beginning of spring, during the leaf-growing stage. Kumquats are not typically grown from seed because they do not thrive on their own roots. They are sometimes grafted onto the rootstocks of oranges and grapefruits. Nagami, the most popular type of kumquat, is oval in shape and has deep-orange fruit with 2-5 seeds per kumquat. Meiwa is larger than Nagami, has a sweeter pulp and juice, and is nearly seedless. Marumi is round and bears orange-like fruits. All varieties grow nicely in a container. Kumquats are ripe when their skin is a deep orange color and the fruit is slightly soft to the touch. Use a knife or scissors to cut off the fruit so you don’t risk damaging the plant by pulling off a larger piece than intended. Cutting off the fruit with a small piece of branch with leaves attached makes a lovely decoration. Kumquats grow beautifully in containers, whether you choose plastic, wood, or a stone garden pot. Use the largest container possible (at least five gallons) and be sure that it has good drainage. If you're concerned about soil escaping out of large drainage holes, you can cover the holes with a screen. Keep the container raised for good air circulation, being careful not to block the drainage holes. 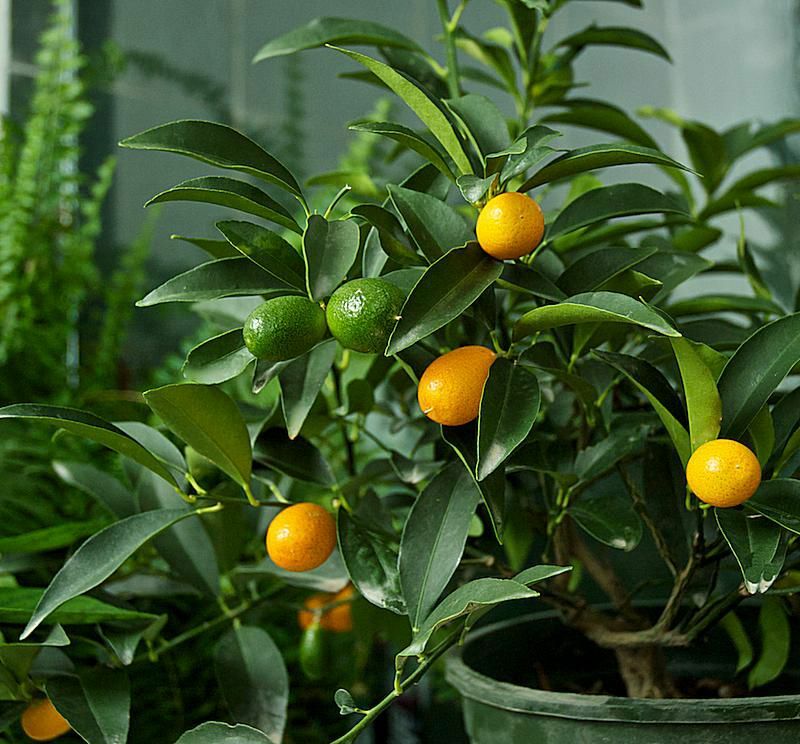 Potted kumquats are susceptible to mealybug infestations and root rot diseases. Combat this by avoiding excess moisture and making sure the soil is well-drained before planting. Also, avoid piling mulch around the base of the tree. Aphids can also be troublesome, although natural predators usually keep them at bay. Horticultural oils used early in the season can help, and if needed, you can treat the tree with insecticidal soap (follow the instructions on the label exactly.) Store any unused insecticide in its original container and out of the reach of children.